This laser printer is the ideal choice for small workgroups and individual users. With a speed of 16 pages per minute and print resolution up to 1200 dpi, it allows you to produce high quality documents quickly and easily. 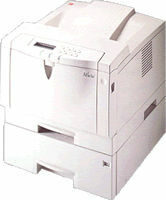 It combines the latest technology to give you the best in network printing.